HOUSTON  (Jan. 20, 2009)  Property sales throughout the greater Houston area ended 2008 as they began, with lower volume following two consecutive record years. Overall property sales fell 16.0 percent last month when compared to December 2007, and sales of single-family homes were down 13.5 percent, according to new monthly data compiled by the Houston Association of REALTORS® (HAR). However, the figures show dramatic improvement from November, when both total property and single-family sales volume declined by more than 30 percent. The average price of a single-family home in Houston dropped 10.4 percent last month to $192,135 compared to December 2007, but rose 1.0 percent to $208,266 on a year-to-date basis. At $145,000, the median price of a single-family home in December fell 6.1 percent year-over-year. The median price represents the figure at which half of the homes sold for more and half sold for less. On a year-to-date basis, the median price was unchanged at $152,000. Sales of all property types in Houston for December 2008 totaled 5,126, off 16.0 percent compared to December 2007. Total dollar volume for properties sold during the month was $960 million versus $1.2 billion one year earlier, a 24.5 percent decline. Full-year 2008 sales of 69,220 properties produced $14 billion in total dollar volume, which was 15.9 percent lower than the 2007 full-year total dollar volume, but flat in comparison to 2005. Rental properties remained in high demand in December, with leases of single-family homes up 26.2 percent and townhouses/condominiums up 24.6 percent on a year-over-year basis. This continues to suggest that many consumers are opting to rent property instead of purchase until theyre convinced of meaningful improvement in the economy. For the full-year 2008 Houston housing market, the numbers showed mixed results. There was a 17.3 percent decline in volume of total property sales and total dollar volume tumbled 15.9 percent, which matched the markets 2005 full-year total dollar volume. However the average sales price for a single family home in 2008 was $208,266, or a 1.0 percent increase on a year-over-year basis, with the median single-family home price of $152,000 flat compared to 2007. The month of December brought Houstons overall housing market disappointing results when all listing categories are compared to December of 2007. Total property sales and total dollar volume fell, as did average and median single-family home sales prices. Total year-to-date property sales were down 17.3 percent. The number of available properties, or active listings, at the end of December fell 11.7 percent from December 2007 to 43,748. Thats 3,606 fewer active listings than November 2008 and is considered an indication that inventory levels are balanced. Month-end pending sales  those listings expected to close within the next 30 days  totaled 3,290, which was 12.8 percent lower than last year and suggests another likely sales decline next month. The months inventory of single-family homes for December came in at 5.7 months, down 3.1 percent from one year earlier and the lowest level of 2008. At $192,135, the average sales price for single-family homes dropped 10.4 percent from December 2007, when it was $214,363. The median price of single-family homes in November was $145,000, off 6.1 percent from one year earlier. That compares to the national single-family median price of $180,800 reported by the National Association of REALTORS®. These data continue to demonstrate the higher value and lower cost of living that prevail in the Houston market. Additionally, total December sales of single-family homes in Houston came in at 4,443, down 13.5 percent from December 2007 and the 16th consecutive monthly drop. HAR also reports existing home statistics for the single-family home segment of the real estate market. In December 2008, existing single-family home sales totaled 3,527, an 8.7 percent decrease from December 2007. At $171,774, the average sales price for existing homes in the Houston area fell 11.5 percent compared to last year. The median sales price of $130,000 for the month was also down 6.1 percent from one year earlier. The number of townhouses and condominiums sold in December fell compared to one year earlier. In the greater Houston area, 378 units were sold last month versus 498 properties in December 2007, translating to a 24.1 percent decrease in year-over-year sales. The average price of a townhouse/condominium dipped to $167,344, down 3.4 percent from one year earlier. 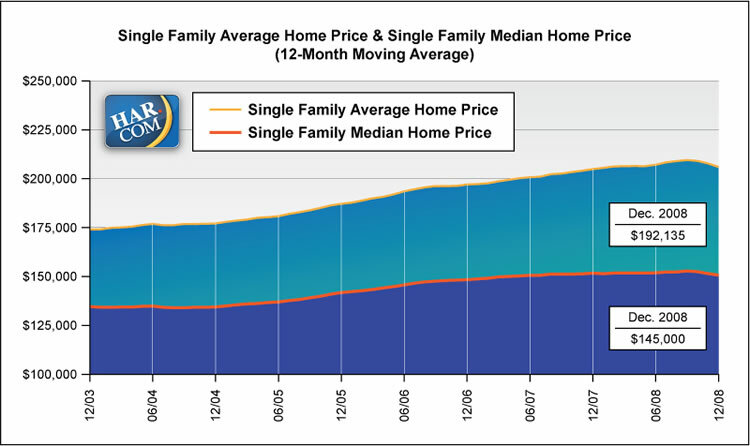 The median price fell 9.7 percent to $125,000 from December 2007 to 2008. Demand for single-family and townhouse/condominium rentals increased again in December. Single-family home rentals rose 26.2 percent in December compared to a year earlier, while year-over-year townhouse/condominium rentals were up 24.6 percent. Fewest single-family active listings since December 2005 (27,612).